Elliott have been in business for over 100 years and are the go to company for the design, manufacture and service of their critical turbomachinery. Elliott is wholly owned by Ebara Corporation headquartered in Haneda, Japan and have manufacturing facilities worldwide, with their primary locations being Jeannette, Pennsylvania, USA and in Sodegaura, Chiba, Japan. Elliott maintain a global network of service facilities with field service engineers and technicians in locations such as UK, Switzerland, Italy, UAE and Bahrain. 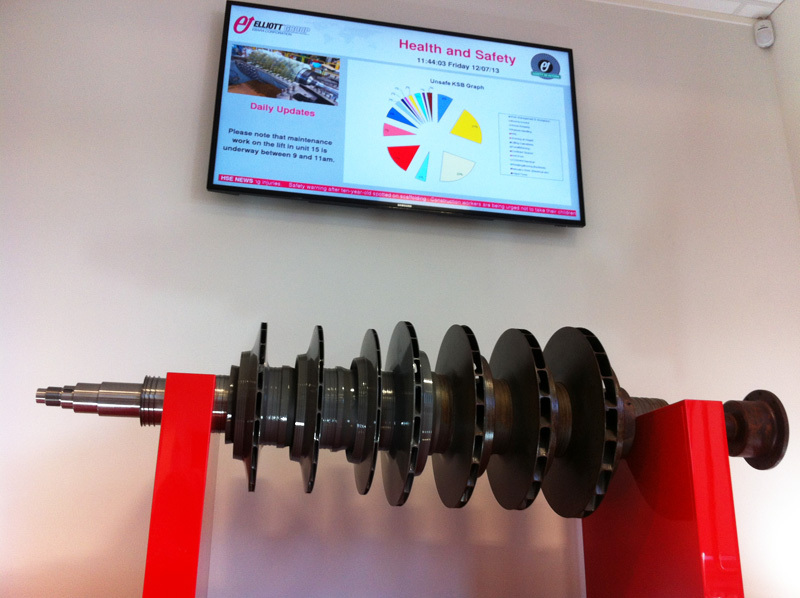 Elliott Turbomachinery UK wanted to enhance their existing Digital Signage installation at their offices in Reading, by placing two screens in the main reception area to deliver core information to visitors and staff alike. 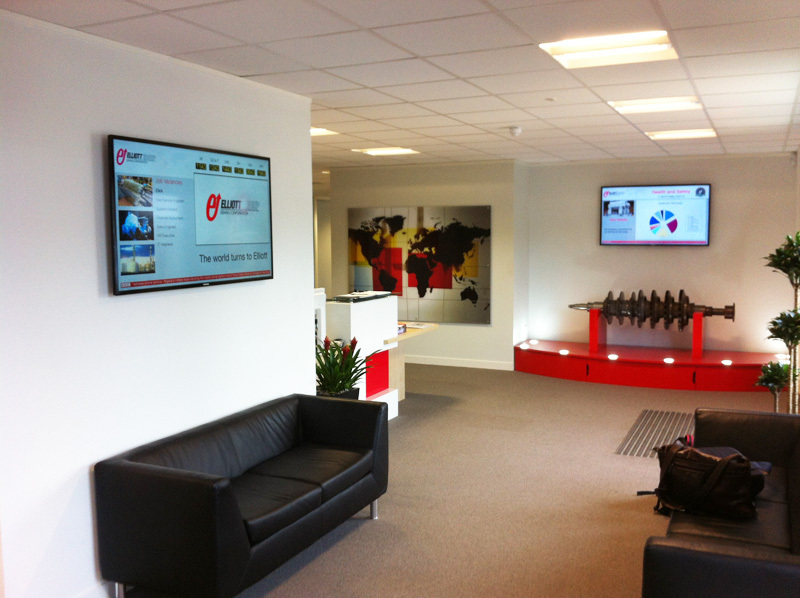 Eclipse Digital installed a ONELAN publisher, rack mounted in the network / comms room together with a ONELAN subscriber to drive one 55″ Full HD LED Samsung Display. 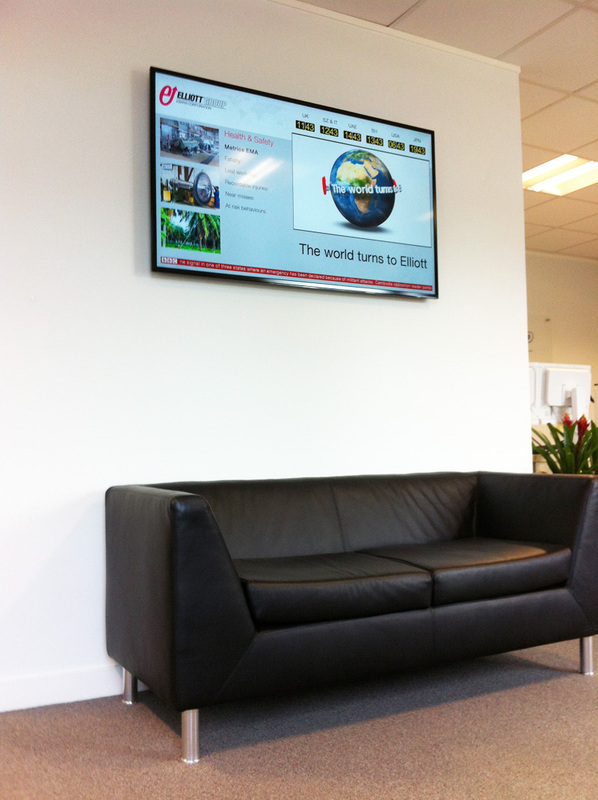 The existing ONELAN media player driving another 55″ Full HD LED Samsung Display was configured to subscriber status to poll content from the new Publisher. 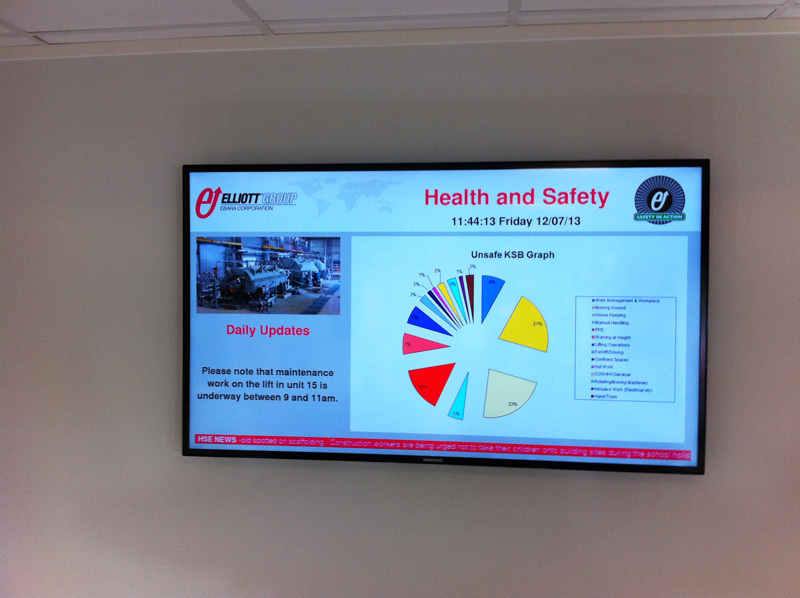 Two channels of content were designed and developed, one to show welcome messaging and corporate information and the other to deliver the health and safety graphical data and daily updates. Within each channel Eclipse configured specific zones with ‘ad hoc’ user access whereby certain users can log in to update just that zone of content, without altering the core layout. Eclipse Digital have provided Elliott with ONELAN Data Collection Engine (DCE) software so they have the facility to pull in data from either Excel, XML or SQL to display graphically, in real time.